Hexagon Composites’ subsidiary Hexagon Raufoss has recently received orders from PT Autogas in Indonesia for CNG cylinders for conversion of 5,000 taxis and government vehicles to compressed natural gas (CNG). Deliveries are scheduled for second quarter of 2017. The Indonesian government is actively promoting the usage of natural gas in order to achieve their oil-to-gas program goal to reduce pollution and diversify fuel in the public transportation sector. According to new legislation that is expected to be issued by the government shortly, all gas stations will be required to have at least one dispenser of natural gas. “We are excited about the momentum of the adoption of environmentally friendly fuels in Indonesia and are pleased that our leading CNG solutions are playing a part in helping reduce pollution in Indonesia. With the country’s ambitious goals, we believe that CNG will be a widely-adopted fuel in Indonesia,” says Ragnar Holthe, Managing Director of Hexagon Raufoss. PT Autogas Indonesia, a subsidiary of PT Draco, is a leading conversion company for natural gas powered heavy-duty vehicles, transit buses and passenger cars. 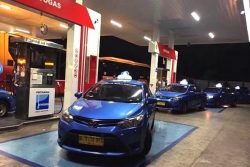 In 2016, Hexagon Raufoss delivered 1,000 Type 4 CNG cylinders to Indonesia for conversion of taxis and governmental vehicles. This type of cylinder is 30% the weight of steel, which reduces fuel consumption and extends range between refillings. Hexagon Raufoss is a member of NGVA Europe.